September 6, 2014. Off the northern coast of Papua lies Biak Island, one of Indonesia’s 17,000+ islands that make up the worlds largest Archipelago. This remote island exists today as it’s own natural paradise, untouched by traveling tourists and nearly free of western influence. But the simplicity of the island is what makes it so unique; Papuans grow and catch their own food and rely on traditions and their own ideas to develop. The remoteness of the land and seclusion from outside sources makes it difficult for Biak to advance in many ways. One of the main problems Biak faces today is the high rate of HIV/AIDS. The regions of Papua and West Papua have two of the highest HIV prevelency rates in Indonesia and the reality is that if traditions stay the same and education about how to protect against HIV/AIDS is never implemented then these numbers will continue to grow. Social issues on the island, such as this one are why people like Harry are so important to the future of Biak. Harry founded Uni Papua, a sport for social development NGO, and has been working on Biak island for two years. He has high hopes for the future of Biak and Papua and is adamant about Uni Papua’s partnership with CAC, using football as a tool for social change. 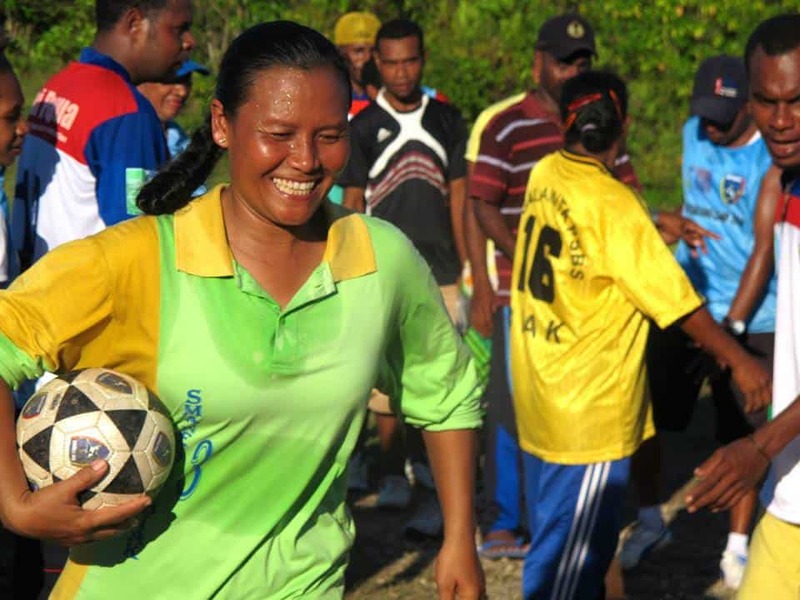 Last year Uni Papua existed in one location on Biak, but this year they have coaches in three different communities on the island. When Brian and I arrived on Saturday we spoke at Biak’s radio station which aired internationally throughout all of Indonesia and the neighboring country of Papua New Guinea. The People of Biak are very appreciative of our time and efforts in their communities. Over the course of the week the coaches learned football games to teach young kids about gender equity, conflict resolution, health and wellness, and and entire day was spent on HIV/AIDS. Our goal is to develop problem solvers, creative thinkers and educated leaders who don’t need to rely on others to make decisions or solve their problems for them. Once the coaches can fully grasp the self-directed learning model of coaching, they are sure to make a difference in the lives of children in their communities. 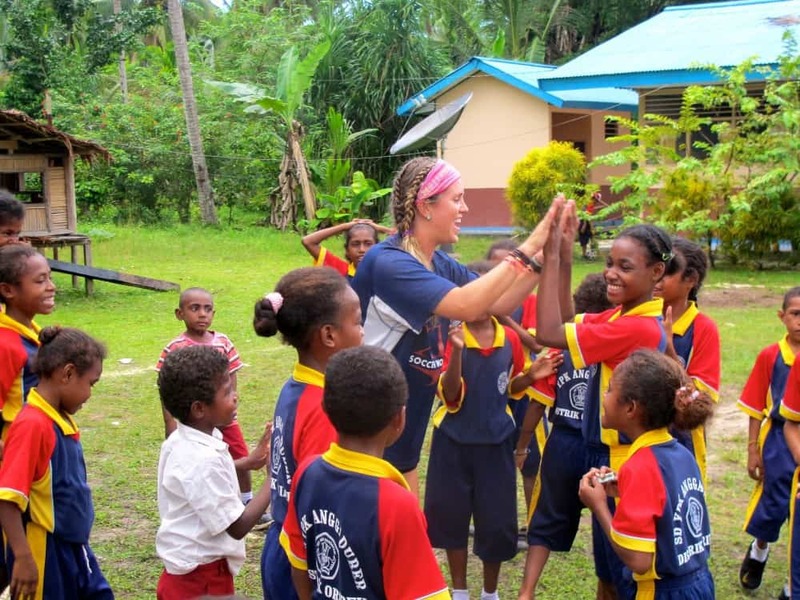 A couple of the coaches that participated in the first year program stood out among the rest which gives us some knowledge of how CAC has had an impact in Biak. The problem solving games were the most impactful over the 5-day coaching camp as the coaches found ways to strategize and problem solve on their own. After playing a game called Old Trafford tag, where players link together when tagged; they used an analogy about how their chain represented a fishing net to catch all the remaining players. It was neat to see them relate a real-world application to solve their problem. Personally it was another week full of surprises and sensory overload in the world of CAC. I think the only time I stopped grinning was when I found worms living in the basin of water I used to shower with everyday. From the tree house nestled deep in the jungle that I dreamt of living in as a kid, to laughing with the children we met at schools across the island every morning, I have fallen in love with the Papuan people and the beautifully exotic paradise island I called my home for seven days. Writing never does enough to encapsulate all that I experience with CAC, but with every village I enter, every school I visit, and every coach I work beside I am able to see the power football can have on a community. And even more so I am able to see the value of social impact through sport that CAC offers around the world.